Discussion in 'HP' started by JBoland17, Jun 9, 2012. Which type is better? And which laptop is the best of each? Envy only has one gb of vram. The envy doesn't have an option for a matte screen. It's also plastic on top and tries to be a macbook too hard. ^Indeed. And the option for the bigger 9-cell battery is a plus, too. 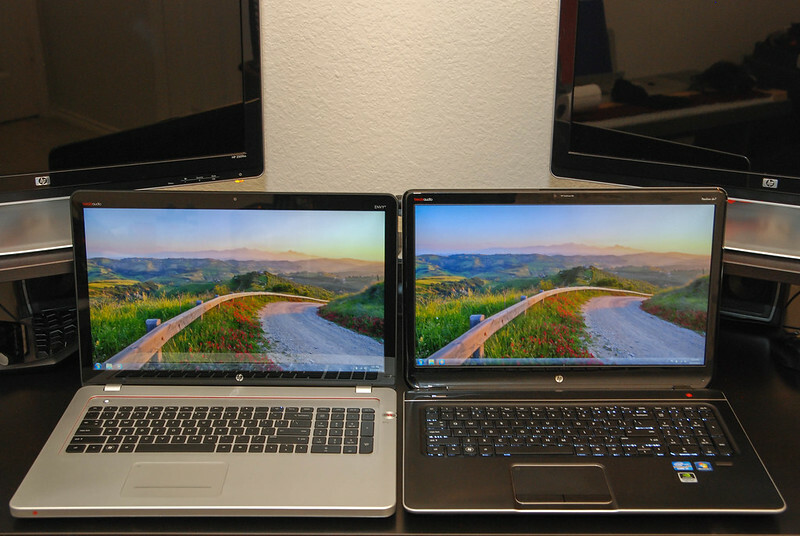 Are you looking at the Envy 15 vs the dv6 or the Envy 17 vs the dv7? Well regardless of facts 75 miles per hour is still faster than 100 miles per hour imo. The top and the bottom are definitely not plastic. I took the bottom plates off last night and you can see the metal where they didn't spray the paint on underneath. The top is either magnesium or some other type of composite material. Definitely not plastic. 1gb of VRAM should not be an issue. I've yet to see a game that uses that much memory where the performance of the 650m didn't hit it's limit before the memory became a bottleneck. The DV series is definitely quieter, but it comes at a price. Heat. These things put out a lot of it when doing anything intense like gaming. It's manageable, but very noticeable. Equally as important is the location of the heat. The CPU/GPU on the DV series is located right under the"WASD" keys. This includes the heat pipes and the single fan that's in the upper left corner. The hard drive bay(s) are also located under the left palm rest. This means that the heat generating parts are where you use the computer most when gaming! The Envy series has dual fans that run at all times. Only varying in intensity depending on the load. This means it's not quite as quiet as the DV series, but it stays cooler at all times. Under load, my Envy 17 barely gets warm. It never gets hot. Also, HP placed the optical drive and the battery left side of the laptop. This means the left side of the laptop stays cool at all times. Perfect for gaming. The CPU/GPU are located hear the left side of the keyboard with the heat pipes and fans near the screen. This keeps the majority of the keyboard cool at all times. So you have to determine whether you want a quiet laptop under light load that gets pretty hot when gaming or you want a laptop that's a little bit more audible under light use, but stays cool while gaming. This is definitely make or break for some people. You'll be staring at this part for a long time. If you have issues with glossy screens, the Envy is not for you. In the environments I use my laptop, this is not an issue. The color reproduction is very similar between the 2 as well as the viewing angles. The finish should be the only major difference. The Envy does have a gimmicky feature built into the screen that I'll mention here. It has proximity sensors at the top of the screen to determine if there's someone in front of the laptop or not. It will turn the keyboard backlight on/off as well as the screen if it doesn't detect someone there. This was an interesting comparison. The DV7 speakers get louder and have a fuller sound to them than the Envy. But the sound does distort at max volume and I'm not sure if it's isolated to just my laptop, but there's a small amount of rattle at max volume as well. The Envy 17 has a clearer sound quality to it, but doesn't get quite as loud or have quite as much bass as the DV7. Both laptops are miles ahead of other laptops I've heard. The Envy 17 also sounds very good as max volume. In terms of port selection, these 2 series are very similar except when you get to options for monitors. The Envy 15 supports dual external monitors and the Envy 17 supports triple monitors with its dual displayports and hdmi port. The DV series supports either VGA or HDMI out, but not both simultaneously which limits you to 1 external display. This is more of an issue for the 17" models than 15". The Envy 15 has an 8 cell battery. The Envy 17 has a 6 cell battery. Sacrifices were made to have an extra hard drive bay in the 17. The DV series offers 6 and 9 cell battery options. I'd say those are all the import differences. Since these models pretty much cost the same, it comes down to what things you are willing to live with. I hope that helps. Personally, I'm keeping my Envy 17 for it's better build quality, better cooling, and multi monitor support. The only deal breaker for me is the screen. If you could at least get a 768 for cheaper then swap out something really great later it would be a buy. The dv6 heat issue is a little infuriating, one can only hope the mobo goes before the warranty does hahaha. It actually works pretty darn well. A lot better than my Cooler Master U3 notebook cooler when it comes to keeping the keyboard cool! Does it really? I have a pretty powerful house fan rigged up under my laptop desk and the more air I blow into the laptop the hotter the palm rest gets. I just assumed the heat was something I would have to live with lol.